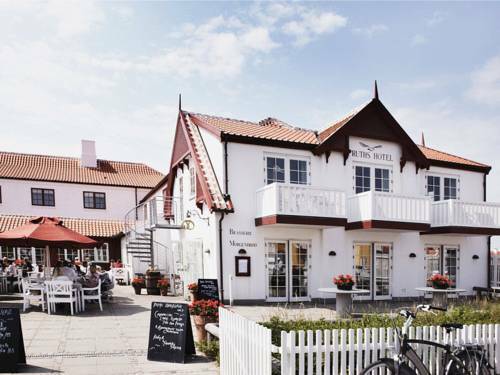 Ruths Hotel Skagen, Hotel Denmark. Limited Time Offer! Ruths Hotel. "Ruths Hotel" is a 3-star hotel. It is a convenient base for visiting Skagen. Guests will appreciate the option to spend some time at the nearby coast. The building has recently been renovated. The residence has 52 rooms in total. Children can play safely in the private patio. Birdwatching and fishing are some of the recreational activities this residence offers. For guests who fancy getting in some sports practice, this hotel also offers golf, tennis, sailing and horse riding as well as a running track and a walking trail, and gym where you have the option to sport on your own. You can also rent a bicycle to take a cycling tour so that you can discover the surroundings. A visit to the spa will help you feel reborn. Go bathing in the whirlpool bath or the real Turkish bath or reap the benefits of a visit to the sauna. You have the option to treat yourself to, for instance, a relaxing massage treatment. The residence has its own restaurant to serve you dinner as well as breakfast, which is included in the room's rate. For a drink in company, you will find the bar most welcoming. If you want to share your experiences online, there is free of charge Internet access available. This modern property offers panoramic views of the North Sea and surrounding dunes. Skagen Nordstrand Beach is 500 metres away. It features floor-to-ceiling windows, a furnished balcony and terrace. Situated a 15-minute walk from central Skagen, this family-run property offers free Wi-Fi and rooms with a TV. Guests have access to a modern, fully equipped kitchen and a furnished outdoor terrace.